Mari Blade Kunai Sword | BUDK.com - Knives & Swords At The Lowest Prices! Inspired by the anime and manga series, Brave 10, the Mari-Blade Kunai Sword is an incredible reproduction of the weapon carried by Saizo Kirigakure. 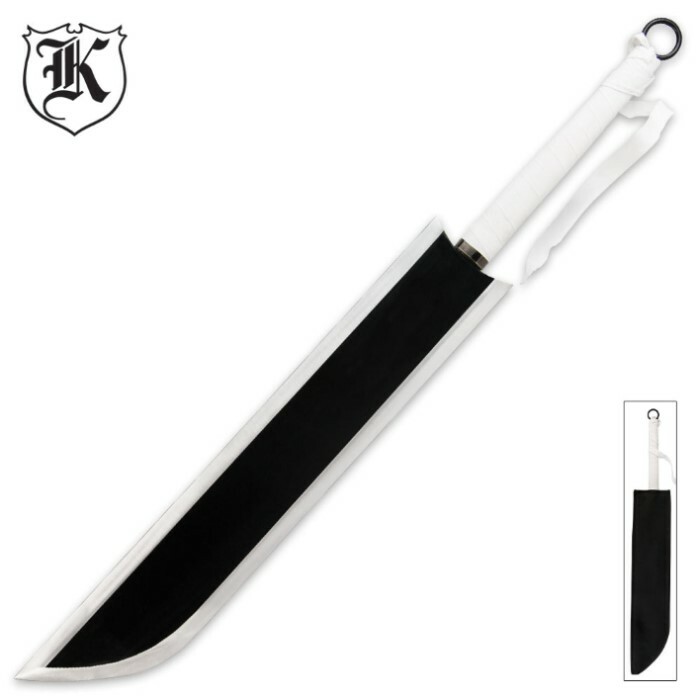 The black plated full-tang sword is made of strong carbon steel. 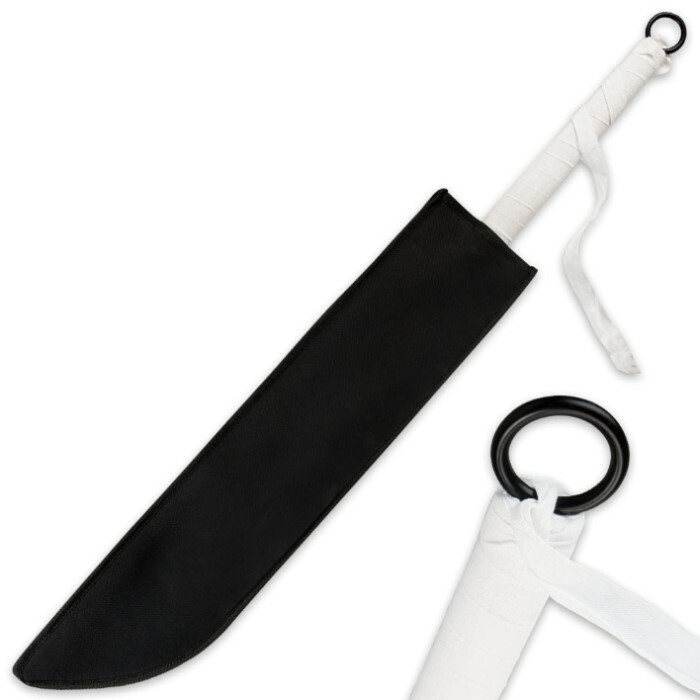 The wooden handle is wrapped with white cord and a black nylon sheath completes the package. As others have noted, this thing is HEAVY. I can wield it one handed, but I'm 6'2" and work out regularly. I can only stop a swing midair if I use both hands, and even then it will be a close call. Its not super sharp, but it does have an edge. Given how heavy it is, I'm sure it will cut through just about anything just fine as it is. Probably get less chips this way too. There IS an edge on the back, but in order to make it easier to handle I will be filing that back down. The blade came pre oiled and looks exactly like the picture. The sheath is a scrap of nylon someone threw together, basically just a holder to keep it from getting oil everywhere. The blade is wide enough that it doesn't need a cross guard, but the ends towards the handle are a little pointy and can poke your wrists if you choke up on it a lot. I might end up filing those down. Overall a fantastic sword for the price, super usable. If you're looking to hang it on a wall, that might be tricky since you'll have to keep it oiled/powdered and the weight might be a problem for something hung on drywall. I just received the sword and overall I'm pretty satisfied my only real issue is that the sword is a lot and I mean a lot heavier than I thought, it was slightly bent him but was able to fix it, and the scabbard was immediately broken.